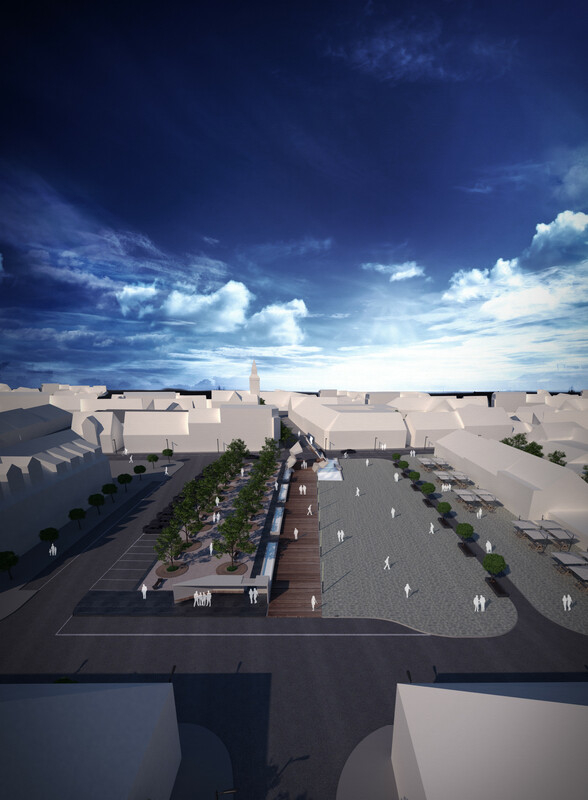 An urban-architectural competition for the concept of reconstruction of the Vilnius Square in Drezdenko. 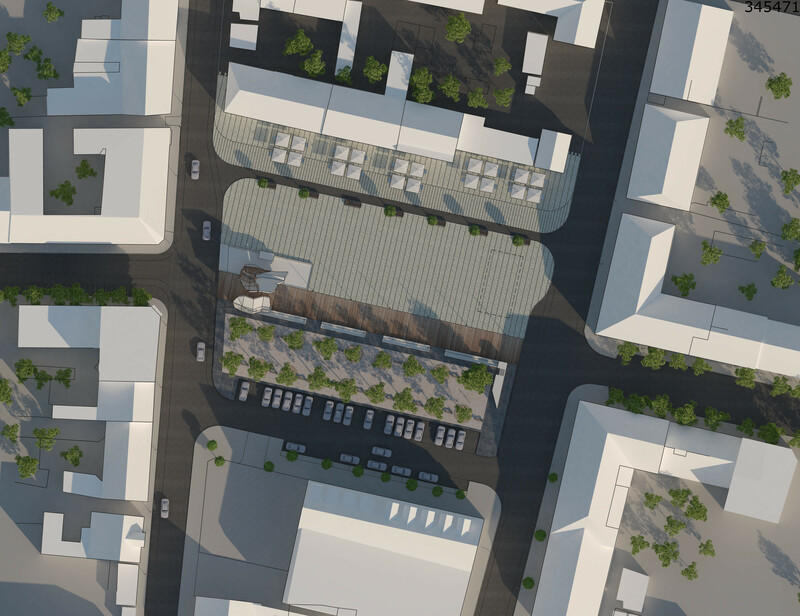 The idea behind the project was to refer to the historical axis “Old Market Square – Twierdza Square”. Numerous reconstructions, especially in the 20th century, marginalized the original east-west compositional axis. The final destruction was to raise the rank of Nowogrodzka and Lwowska streets and establish a square in the eastern part of Wileński Square. The second, equivalent goal of the design work was to restore the representative character of this place as an urban salon, attractive to residents and tourists. The presented concept is a voice in the discussion on shaping urban space in small cities in the era of New Urbanism (“New Urbanism”), the return to traditional urban development, promotion of urban transport, cycling and pedestrian zones. The composition was dominated by the main historical east-west axis. It was emphasized by a pedestrian street with a wooden floor and an elongated fountain running the entire length of the square. 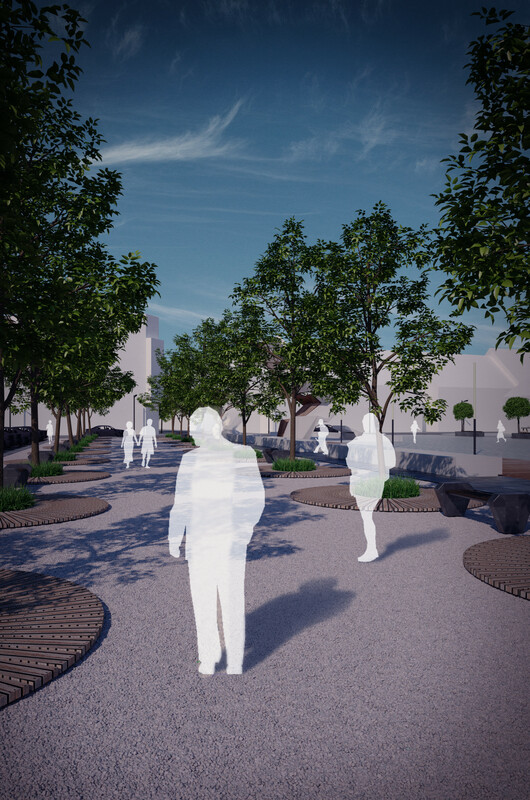 Designed high greenery, connects the Old Market Square with the green areas of Plac Wolności. The urban commemoration of this space is a monument commemorating 700 years of the city rights of Drezdenko. The monument was located at the intersection of the axis of Warszawska and Bolesława Chrobrego Streets. Its form refers to the plans of a historic fortress. Similarly to the monument of Franz Balthasar von Brenckenhoff, the new accent is to designate the view axes in the east and west. In order to close the square, it was proposed to build a corner plot No. 657 (at the junction of Nowogrodzka Street and Plac Wileńskiego). Currently, it acts as a parking lot for a nearby commercial facility. The whole has been divided into three zones. The first, the largest, has representative functions. It was designed as an open space for celebrations, culture-making events (including concerts, performances) and special events. The recreation area was located in the southern part of the square. Benches placed between the trees, allow you to rest in a shady place. The new square also has the function of soundproofing from nearby commercial buildings. Last, the “service” zone was located at the northern frontage. There are places for cafe and restaurant gardens. The pedestrian system refers to the designed spatial composition. 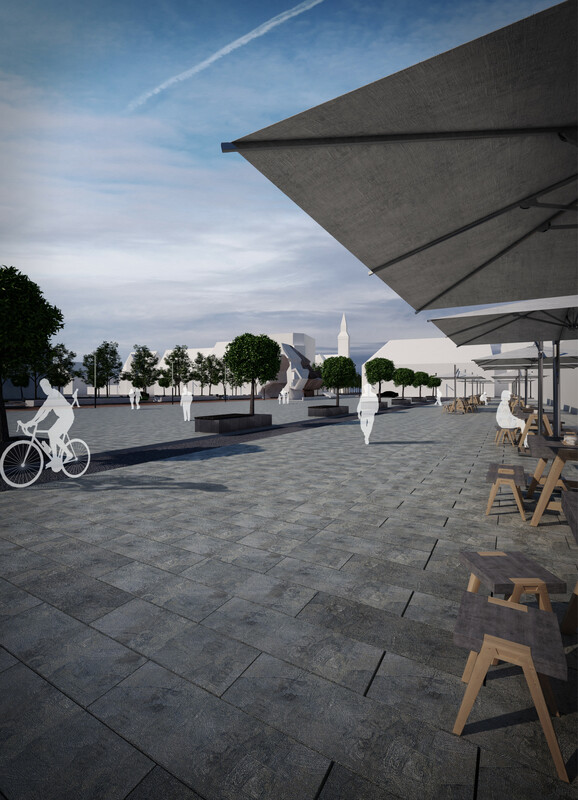 A pedestrian and bicycle route is proposed, connecting the Old Market Square with Wolności Square. In order to implement it, it is suggested to reduce or even remove parking spaces on ul. Warszawska and Bolesław Chrobrego. The road project assumes the transformation of the southern roadway into a two-way road and the transformation of the northern road into a zone of calmed traffic. 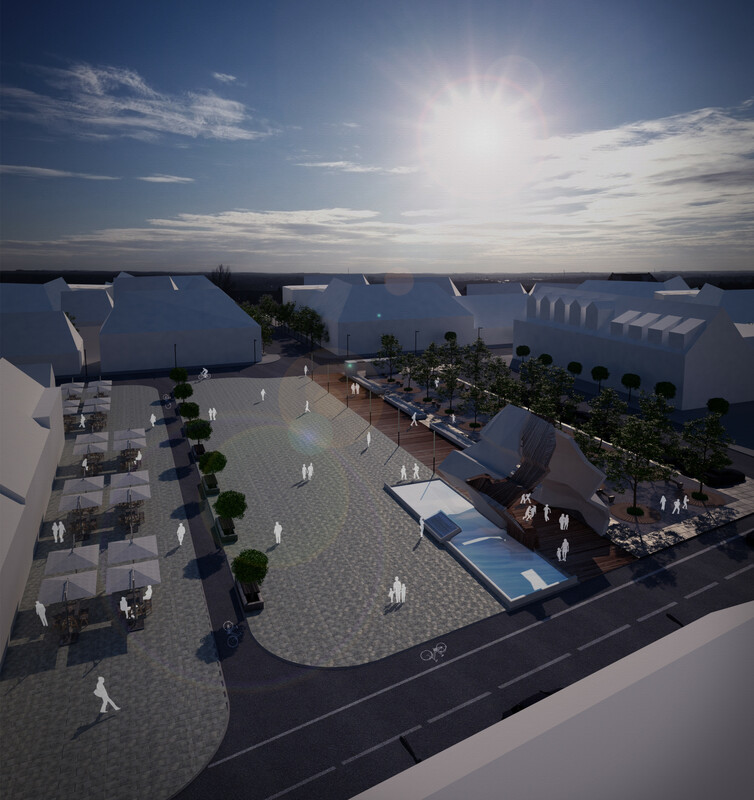 Access to the northern property is to take place on a designated pedestrian on the square’s plot. At the same time, a bicycle route was created, connecting paths on Nowogrodzka and Lwowska streets.